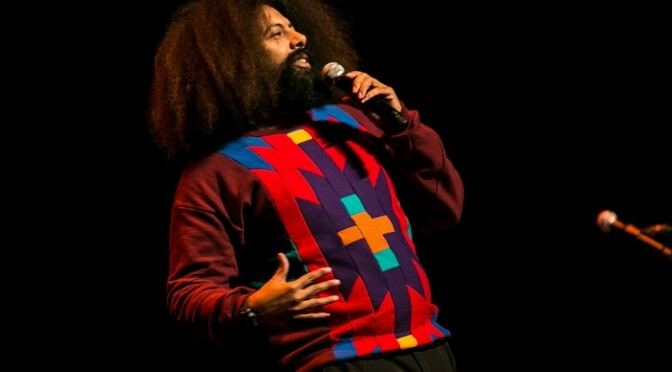 Reggie Watts returns to Australia for JUST FOR LAUGHS SYDNEY 2014 as well as shows in Perth, Melbourne and Brisbane. Following his sold out shows in the Sydney Festival 2009 and rocking the Lilyworld at the 2011 Big Day Out, Reggie Watts returns to Australia in April 2011 for some very special shows! Reggie Watts began his career as a singer in various bands in the early 1990s. Then he started being himself. Crazy. Absurd. And the people laughed. They’re still laughing. In his unique sets, Reggie’s subjects range from ancient history, technology, magic, spirit elves, dragons, mythology and theology to pop culture. The music, exploiting a jaw dropping vocal range, incorporates hip-hop, tripͲhop, 80’s pop alternative, nu-metal and classical opera – no two songs are ever the same. Reggie loves to disorient and confuse people in the most entertaining way possible.